In his day Charles Churchill (1731- 1764) was a popular poet and satirist, hated by the establishment but held in high esteem by an influential section of society. Besides his poems, Churchill’s lasting legacies are in relation to Dover – a memorial tablet in St Mary’s Church, a poem by Lord Byron, and his grave near the top walk of Charlton Cemetery. Churchill was the son of the curate at St John’s Westminster and it was envisaged that he too would join the church. However, in his mid-teens he rebelled and spent his time frequenting theatres and taverns until he impetuously married at the age of 18. This brought the young Churchill to heal and he was sent, with his young wife, Martha Scott, and son, to Sunderland to train for the clergy. In 1753, Martha inherited a legacy and they returned to London where Churchill was ordained a deacon and appointed curate of Cadbury, Somerset. The family, which now included two sons, moved there and Churchill threw himself into parish work. After three years he was ordained and given the living of Rainham, Essex. 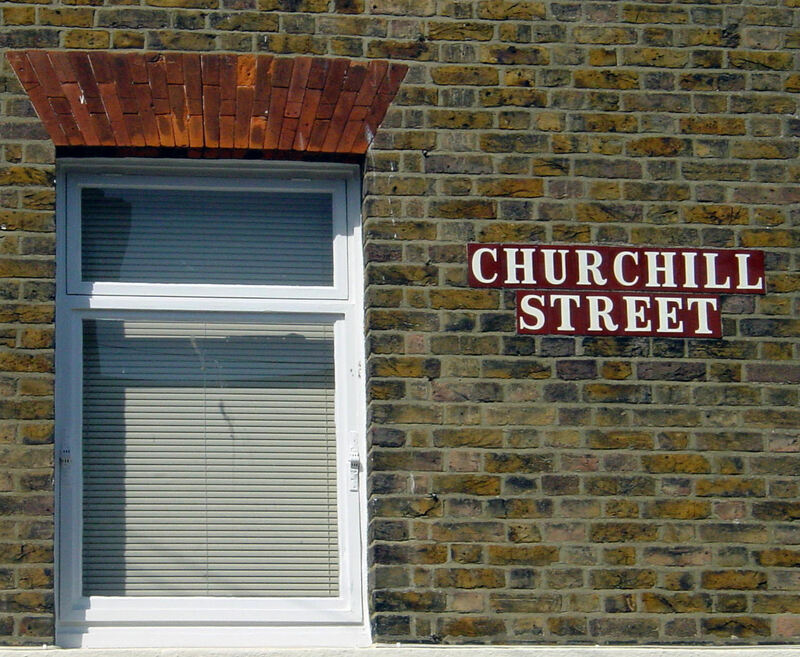 Churchill’s father died in 1758 and Churchill was given his parish of St John’s, Westminster. His father had been very popular but Churchill increasingly failed to live up to what was expected of him. Consequently, to support the family, he was forced to supplement his income by undertaking private tutelage. It was about this time that Churchill met up with the friends of his youth, known as the notorious Hellfire Club. They frequented theatres, taverns and brothels and published satirical observations. Quickly, Churchill fell foul of the Dean of Westminster and his marriage began to fail. Further, he became deeper in debt and was threatened with imprisonment. In response, Churchill wrote his first satirical poem, The Conclave directed at the Dean of Westminster but out of fear of legal proceedings withheld its publication! Nonetheless, in March 1761 Churchill wrote Rosciad, a poetic satire about the actors and actresses on the London stage. This he published anonymously and at his own expense and the work was an overnight success! However, critics attributed it to other authors – who did nothing to disclaim the credit. Churchill reacted by publishing and signing the Apology, another poetic satire, which secured both his fame and fortune. He resigned from the church, separated from his wife and paid back his creditors. Churchill’s next publication, The Prophecy of Famine: A Scots Pastoral (1763), was a satire aimed at the Prime Minister, John Stuart, 3rd Earl of Bute, and favourite of George III. The owner of the publication was arrested and Churchill was threatened with legal action but in the end Lord Bute was forced to resign his parliamentary position. Churchill’s publications that year also included the Duellist aimed at members of the House of Lords; The Ghost in which he attacked well know writers of the time and The Candidate, aimed at John Montagu, the 4th Earl of Sandwich. The Earl of Sandwich, at the time, was involved in the prosecution of John Wilkes, another member of the Hellfire Club, for obscene liable. To escape from imprisonment John Wilkes fled to Boulogne and on 22 October 1764 and Churchill went to see him. Within a week, Churchill was sick with ‘military fever’ and on 4 November died, he was thirty-three. 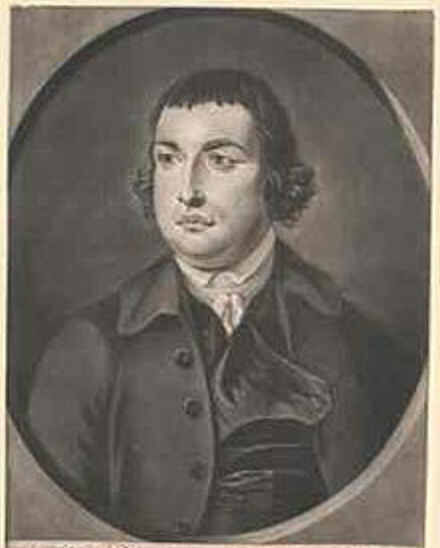 Another member of the Hellfire Club, Humphrey Cotes, returned Churchill’s body to Dover and he was buried in St Martin’s Churchyard, where the Discovery Centre is today. 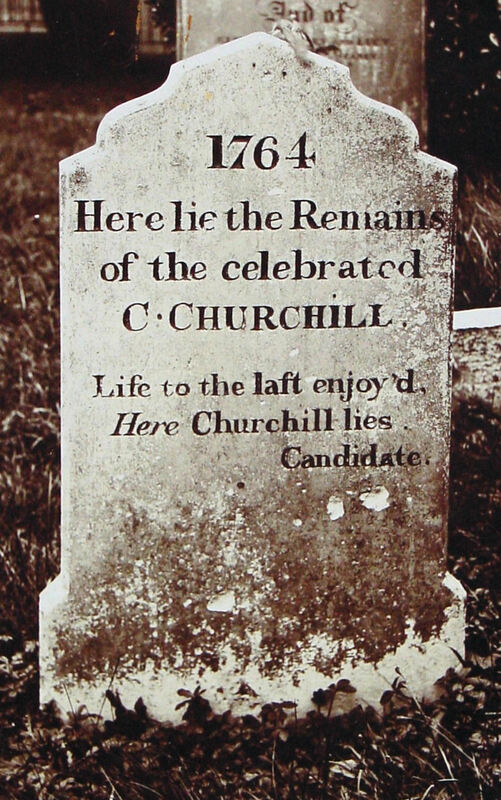 The funeral was attended by the principal inhabitants of Dover, ‘as a mark of their esteem.’ Jarvist, a local mason, cut the inscription, ‘Life to the last enjoy’d, a line from Churchill’s poem, the Candidate finishing with ‘Here Churchill lie.’ Churchill left his wife £60 and provided for his two sons. 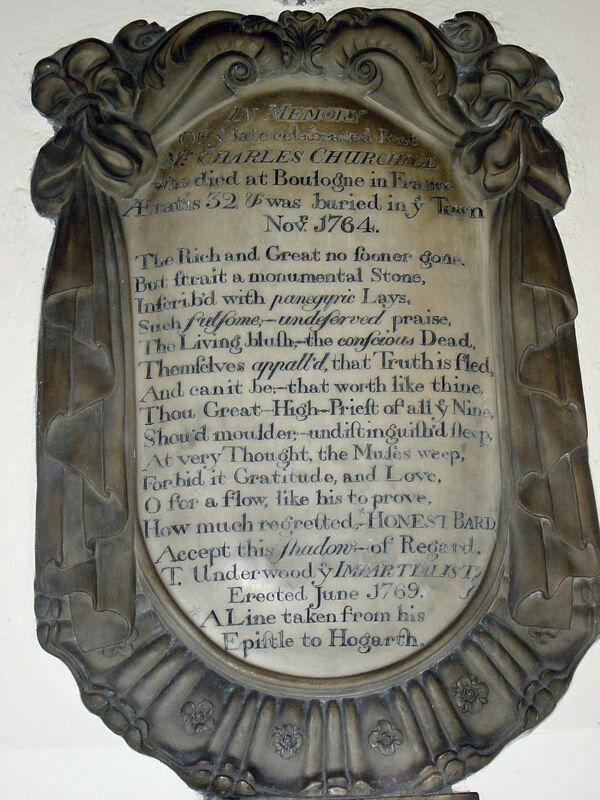 T. Underwood, in 1769, erected the memorial tablet to Charles Churchill on the south wall of St Mary’s Church and it includes a line from the poet’s Epistle to Hogarth. Although, in the late 19th century there were calls to remove the plaque on the grounds that, ‘Mr Churchill used his pencil as an instrument of revenge,’ it can still be seen. Churchill’s Grave, by Lord Byron, (1788-1824). In the summer of 1970 St Martin’s Cemetery was scheduled to be demolished to create Yorke Street. In July Kent Archaeological Rescue Unit, (KARU), archaeologist Brian Philp, obtained a special Home Office licence to exhume the site before its destruction. This involved recording 80 tombstones, including that of Charles Churchill. The graves were carefully exhumed and the contents placed the contents in special containers. They were then taken to Charlton cemetery and placed in a very large communal grave and reburied with clerics officiating. This entry was posted in Churchill Charles - Poet, People. Bookmark the permalink.